Jake McLeod has broken through to record his maiden professional victory winning the NSW Open Championship on Sunday at Twin Creek Golf Club. McLeod fired rounds of 67-68-62-71 to finish at 20-under with Saturday’s 62 a new course record. 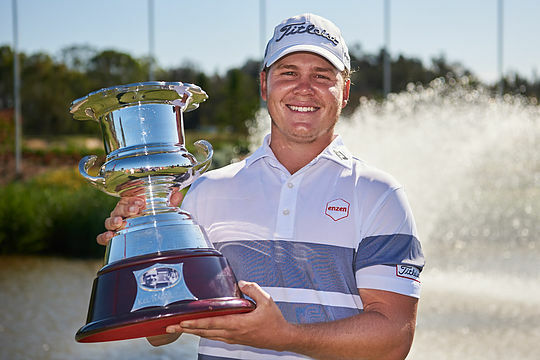 With the victory McLeod collects the winner’s prize cheque of AU$72,000, Official World Golf Ranking points and full status on the PGA Tour of Australasia until the end of the 2020 season. “It’s great to finally get the breakthrough win,” said McLeod, who has three runner-up finishes, one at the Royal Cup on the Asian Development Tour, the Victorian Open and at the South Pacific Open on the Australasian Tour. McLeod made the turn at even par, enough for him to retain his overnight lead heading into the back nine. A eagle on the 12th widened his lead further to 4 with seven to play. “I was able to keep it going and played smart golf,” said McLeod. Victorian rookie professional Cameron John was the runner-up on 18-under-par and at one stage at the 16th hole he was just one shot behind McLeod. John played the last two holes aggressively to fire 5-under 67 and finish two shots short after McLeod bogeyed the 17th. John had blasted out of the blocks early with a birdie on the 3rd followed by a quartet of birdies from 6 through to the 9th. Four more birdies during the middle part of the back nine moved Jones into contention and he continued to play aggressive closing golf over hitting the par 3 17th to record a bogey and then on the 18th, thinking he needed to make birdie, his aggressive putt missed resulting in a bogey. Blake Windred claimed low amateur honours after he finished tied third alongside Dylan Perry and Josh Younger on 15-under the card. A shot further back in a tie for 6th was David McKenzie (VIC), Jordan Mullaney (NSW), and rookie pro Douglas Klein (QLD), who has played his way into the Emirates Australian Open. Also earning a place in his national open thanks to finishing 9th this week is Queenslander Blake Proverbs, who rounds out the top-10 on 13-under the card alongside Dimi Papadatos (NSW) and Harrison Endycott (NSW).